The summer of 1996 brought many life-altering changes. My co-parenting partner of over 20 years and the father of our son moved out of our collective home quite suddenly and my on-again/off-again romantic partner of the last five years and I split up; I completed the almost-final draft of my dissertation; and my son attended a residential musical theater camp, freeing me from parenting responsibilities for two months for the first time in over 16 years. I had a lot to contemplate while sitting on the beaches of the nearby New Hampshire lakes and swimming during my now copious free time. . . . Delighted to be invited to attend the planned Cesarean birth of a friend in Sedona, Arizona, in September, I planned my trip west. After these stressful and unusual summer experiences, I was happy to be visiting both her and another long-time friend who had recently moved to Boulder, Colorado. When I arrived in Denver, I found that my friend (also a student of Chagdud Tulku Rinpoche) and Lisa had successfully conspired to kidnap me from the airport. Instead of taking me to Boulder, they took me to the newly minted Lama Shenphen Drolma’s evening teaching in Fort Collins and then to a weekend of Red Tara teachings at a retreat center south of Denver. I suppose I could have jumped out of the moving car, but I chose to go along. Plus, as Lisa kept reminding me, I had promised to give Buddhism a try once she was teaching it—and so, I did. I had loved Lisa’s teaching style even before she taught Buddhism, so it was no surprise that I still resonated with the way she brought information to a group even in this context. She was funny, lively, articulate, and congenial as well as knowledgeable and persuasive . . . VERY persuasive. I liked the chanting and the energy. Having almost everything conducted in English made it accessible. As a feminist and sometime Goddess/Wiccan practitioner, I also very much appreciated praying to and visualizing a female “deity” even though I didn’t understand most of the teachings or the practices’ foundations. By the end of the weekend, despite my protests and objections, my heart had started sneakily to open. Red Tara “Concise Practice” English text in hand, I had agreed to do 100,000 mantras and daily Red Tara practice until I saw her again when she came to New York City to teach the preliminary practices—Ngöndro—in early November, all in preparation for Chagdud Tulku Rinpoche’s New York and Boston visits in mid-November. 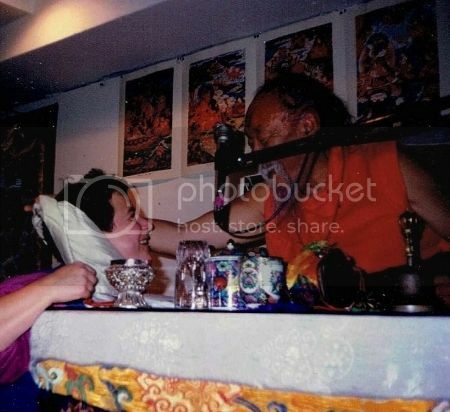 Since Rinpoche’s visits to the United States, especially the East Coast, were rare because he had moved to Brazil, Lama Shenphen quite strongly suggested that I plan to take all the empowerments for Ngöndro and Red Tara and also to take Refuge, which she promised to explain at a later date. 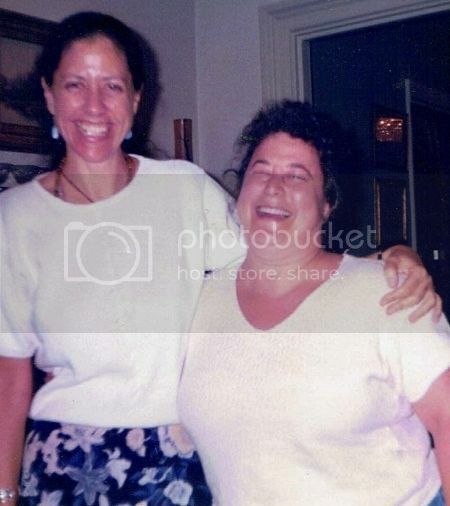 When that later date came, I had met my commitment and so joined my now-friend, former partner, M, to drive from New Hampshire to New York City for Lama Shenphen’s Ngöndro teachings. About 20 of us gathered in the Park Avenue penthouse apartment graciously offered for this purpose by a student of Rinpoche’s. Some had already had empowerments and begun or even completed their 400,000 accumulations of these practices and mantra recitations. Others, like me, were brand-new. It is a testimony to the skills of Lisa and many other Buddhist teachers as well as to the variegation of the Dharma itself that lamas manage to “meet” each of us in any room regardless of where we are in our understanding or experience. Two “moments” stand out among many from this weekend. First, when Lisa talked about the Guru Yoga practice, her devotion and gratitude to and love and respect for her teacher caused her to weep as she spoke. Yet, she remained eloquent as she explained, while demonstrating, the value of having a qualified teacher and how to use that relationship to ground one’s practice. Second, at some point during her explanation of the visualization for this portion of the practices, I felt the room suddenly expand. I had been sitting near the front, but I abruptly felt too hemmed in, too close to her. I had to move back, way back. The long, narrow room allowed me to get about 30 feet from her, but even with my back against the wall, it wasn’t far enough to give me enough distance to encompass the vastness of the space that I perceived to be all around and between us. My heart was pounding, and I couldn’t understand her words or even see her or the others or the furniture any longer. It all evaporated into nothingness, including me. I nodded “Yes,” to the first, but I had no idea what he meant by the second. I knew something momentous had occurred, but what? Later that month, I attended all the empowerments Rinpoche offered in both New York City and Boston. I also took Refuge and received my Refuge name, which unexpectedly moved me to tears. It would be almost ten years before I had the slightest inkling as to what taking Refuge actually involves, but I’m glad I did it and so many other Dharma activities, despite my ignorance. I can testify that, apparently, this stuff works even when we have no idea what we’re doing, aren’t doing it right, and don’t even know why we’re doing it—as long as we keep doing it. Rinpoche and Sally, after teachings, Refuge, and empowerments. For the next two years as I practiced Red Tara and accumulated the practices for Ngöndro, back on with my romantic partner, M, Lama Shenphen and she decided to start a Dharma center that might become an assisted living home in Maine and invited me to be part of it. Chagdud P’hande Ling existed in Maine without a location from 1997–98 and then in Saco on site for one year. 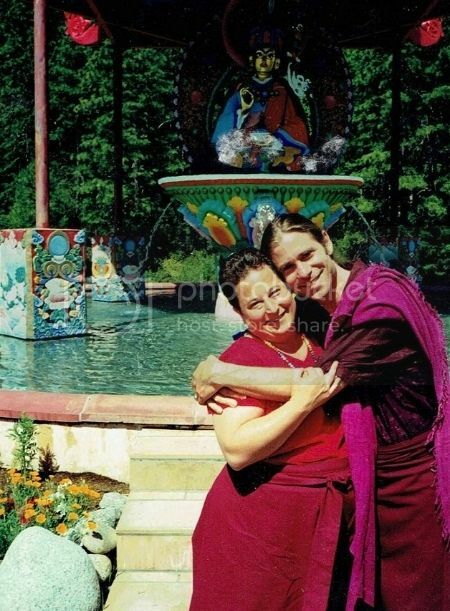 But, near the end of 1999, Lama Shenphen decided that we should sell it and move to New Mexico/Arizona (where she was already based) to join her growing sangha there because it was too difficult for her to guide us long-distance. We struggled with Lama Shenphen’s inner conflict about being my teacher during those years. Even so, I completed my Ngöndro, started one Dharma center, and helped start another, both of which I lived in and was coordinator for (in Maine and New Mexico) under Lama Shenphen’s direction. As I got closer to finishing my Ngöndro, Lama Shenphen talked to me excitedly about making plans to go to Brazil to attend the “first-year” Dzogchen retreat with Rinpoche. But, it didn’t feel right for me to go to Brazil. I had been having dreams about Wyn (like Lisa, a former friend, who was ordained by Chagdud Tulku Rinpoche in 1995) as Lama Drimed even though I hadn’t seen him in almost ten years. I knew he was important to me. I felt pulled to California, to Lama Drimed’s own “first-year” Dzogchen retreat. His six-week retreat was modeled on Rinpoche’s and conducted with his blessing, since Rinpoche had made Lama Drimed his Dzogchen lineage heir and the spiritual director of Chagdud Gonpa at his ordination. Lama Shenphen and I argued about this for months, but despite her insistence, I was adamant. When I talked with Lama Drimed on the phone and told him about my dreams, he was cautious, but acquiesced. He invited me to come to Rigdzin Ling in the summer of 1999, with this warning: “Some people who knew me ‘before’ can’t make the transition to accepting me as a lama. We’ll see how you do.” He suggested I come a week early, to “acclimate,” and stay in the shrine room rather than the campground. I agreed. This was the best decision I ever made, although it contributed to ending my teacher-student relationship with Lama Shenphen. I was right. Lama Drimed was my root lama, my heart teacher. How had I known that? Even though I had been at Rigdzin Ling for a week, we hadn’t encountered each other. When he entered the shrine room on the first day of the Dzogchen retreat, it was the first time I had seen him since 1989. As he emerged from behind the drapes separating the shrine room from the porch, my heart leapt. Tears burst from my eyes, and my heart fluttered as if it wanted to fly to him, straight out of my chest. He didn’t speak. None of us did. We all stood and watched as he walked in, the epitome of grace and equanimity, carrying one long-stemmed red rose. Approaching the throne on which a large, framed photograph of Rinpoche was resting, draped with a white katak (ceremonial scarf), Lama Drimed placed the rose reverently in front of the photo. He then stepped back and prostrated three times to his teacher’s image. I wept at feeling the depth of his love and devotion for Rinpoche. That same experience I had had in New York City, of the room’s vanishing and everything blending into oneness, occurred again. I was beginning to feel that rare combination of devotion, love, and unending gratitude to Lama Drimed— my true root lama—and extended the same to Lama Shenphen for being my first teacher. I did two individual summer retreats under Lama Drimed’s guidance, seven weeks in 2000 and nine weeks in 2001. At the end of 2001, when my contract work in New Mexico ended, I moved to northern California to be closer to him and to Rigdzin Ling. In Sonoma County, I joined the sangha of Chagdud Tulku Rinpoche’s son, Tulku Jigme. I began to attend Sunday pujas and learned the practices, instruments, and umze (chant leader) role there. 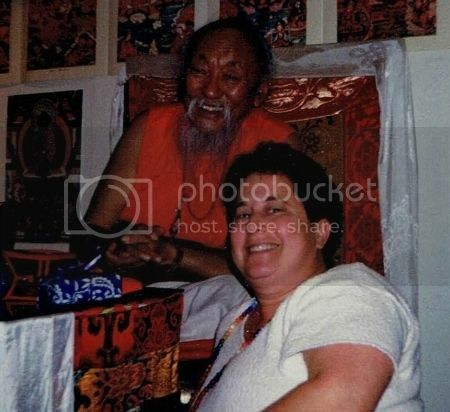 I learned of Rinpoche’s unexpected passing in the fall of 2002. Since I had a full-time job I had just begun and couldn’t leave, I volunteered to be the umze who would “hold” Ati Ling’s weekly and monthly practices while Tulku Jigme and many others traveled to Brazil and Tibet to commemorate Rinpoche’s passing with traditional rituals and practices. During the time I was the umze for Ati Ling, I met a resident, P, a Tibetan born in India, who offered to tutor me in Tibetan. P and I quickly became friends, and I started tutoring him in English in exchange for his tutoring me in Tibetan, an arrangement we kept up for over six years. Eventually, I stopped learning Tibetan (but I learned it well enough to correspond with my “adopted daughter,” a student my son and I sponsored throughout her years at The Siddhartha School in Ladakh). Since 2000, as a person and as a practitioner, I have not had it “easy.” I weathered separating from Lama Shenphen and the Iron Knot Ranch/Silver City sanghas, the ending of several romantic relationships and jobs, losses of a few close friendships due to moves or conflicts, a schism at Ati Ling which drove me away, and Lama Drimed going into three-year retreat and his subsequent resignation and departure from Chagdud Gonpa/Rigdzin Ling (luckily, he decided to settle very close to where I was already living, so I got to see him more often than before). Two of my dearest sangha friends died, and I also had numerous and some life-threatening health problems (now mostly resolved). I moved seven times and now live in Missouri, far away from sangha and my dear lama physically, thus very isolated regarding the Dharma. 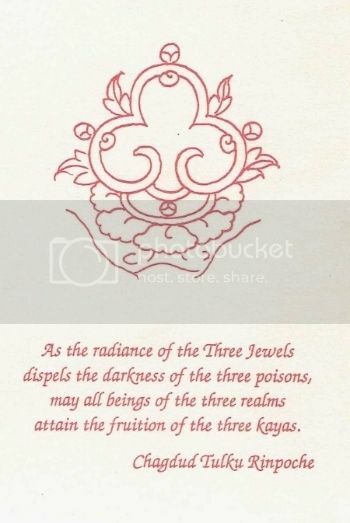 However, I have had the great good fortune to study the entire text of Shantideva’s The Way of the Bodhisattva with Khentrul Lödro Thaye Rinpoche for an entire year and to receive a few teachings on other topics. I was also able to attend a series of teachings by Lama Zangpo from Chagdud Gonpa and talks by many visiting teachers throughout the Bay Area over the 13 years I lived there. Even more precious, from 2000–12, I was able to do several individual retreats under Lama Drimed’s direction, lasting from 10 days to 11 weeks, at Rigdzin Ling or at home. I also attended four Drubchens and a few Drubchöds. I hope to be able to do more retreat soon. I have not missed even one day of practice, reciting mantras daily even when I couldn’t meditate while concussed. I am unwavering in my devotion to my teachers and to the Dharma, and committed to attempting to liberate myself and all sentient beings from samsara. Buddhism is my spiritual home, and I am beyond grateful to have found it again. It’s been quite a journey and it’s not over, yet. May all beings benefit. Sally Ember, Ed.D., has been passionate about writing since she was nine, winning prizes for her poetry, stories, songs, and plays from a young age. Currently, she meditates, writes, swims, reads, and hosts her Google+ Hangout On Air (HOA) also on YouTube, *CHANGES*, LIVE conversations between authors, almost every Wednesday, 10–11 a.m. Eastern time, USA (on hiatus until January, 2016). She especially welcomes Buddhist writers and bloggers on her show! You can contact Sally on sallyember@yahoo.com or visit www.sallyember.com. This article is one of a series on how Buddhism has impacted the lives of practitioners. We welcome you to send us your story as well. Write to info@buddhistdoor.com. This article is published on the occasion of Lama Drimed’s 60th birthday.